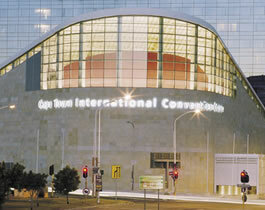 Upon its opening in 2003, the state-of-the-art Cape Town International Convention Centre (CTICC) was recognised by the South African Institute of Architects as “flexible, modern, international and cool...made for its varied purposes”. Since then, thanks to its size and sophistication, the CTICC has put Cape Town on the map as a major international Congress destination. Ideally located on Cape Town's foreshore, adjacent to the Waterfront, the central business district and leading hotels, the CTICC is an exceptional facility that meets the expectations of delegates and organisers alike. 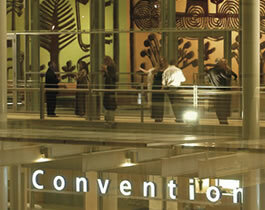 There are more than 3 500 rooms within walking distance of the CTICC offering budget to luxury accommodation. This includes the connected 483-room five-star Westin Cape Town, with direct access to the heart of the convention centre. There are more than 16 000 rooms in hotels, B&Bs and guesthouses within a 45-minute radius of the city centre.